Classic ME2, Solid-State Pre-amp from Cadac Electronics. Cadac is showing its Classic ME2 dual-channel mic pre-amplification mixer/EQ at the Musikmesse. 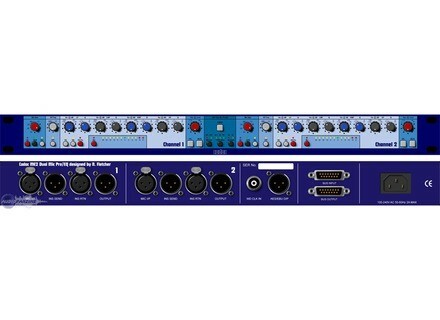 This is a 19-inch rack-mount processor, with analog outs and a digital I/O and networking interface. You can visit the Cadac stand at Hall 8.0, stand L64. [Musikmesse] Cadac Electronics LIVE1 Cadac is showing its new LIVE1 console at this year's Musikmesse / ProLight & Sound in Frankfurt. [Musikmesse] Shure Beta 27 Shure Incorporated announced the introduction of the latest addition to its line of precision-engineered Beta microphones, the side-address, supercardioid Beta 27. [Musikmesse] 11 New MicW Mics MicW is launching 11 new products at this year's Pro Light & Sound/Musikmesse exhibition in Frankfurt, Germany, from handheld vocal mics to compact, desktop, shotgun and boundary models.